When analyzing a large patent portfolio it is often difficult to determine where to spend diligence dollars first. In order to direct us to the specific assets that are more likely to be interesting we developed an in house heuristic ranking system. It is based on static patent characteristics. The image above describes the specific component scores for each of five characteristics. 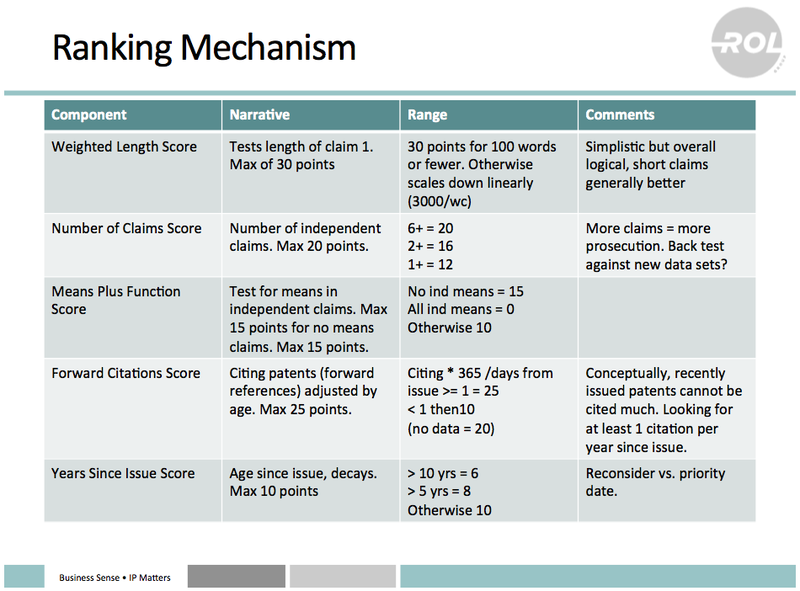 We used this system to rank the assets in Intellectual Venture’s patent portfolio (IAM Magazine, Issue 66 July/August 2014). These component scores are then summed to create a raw rank (max 100) and bucketed into groups of interest. High > 85, Medium > 75 and everything else is rated as Low. It should be noted that theses rankings are intended for the general grouping of patents by likelihood of value, not for direct patent-to-patent comparison. It is possible for a specific low ranking asset to be of more interest and value than a high ranking one. We have used this method across projects for over five years and have found that when compared to both alternative (more complex) scoring systems and initial human review (< 1 min per asset) of 1000+ asset portfolios it yields similar, though not identical, groupings. Overall, this ranking method has given us a very high return while maintaining simplicity. 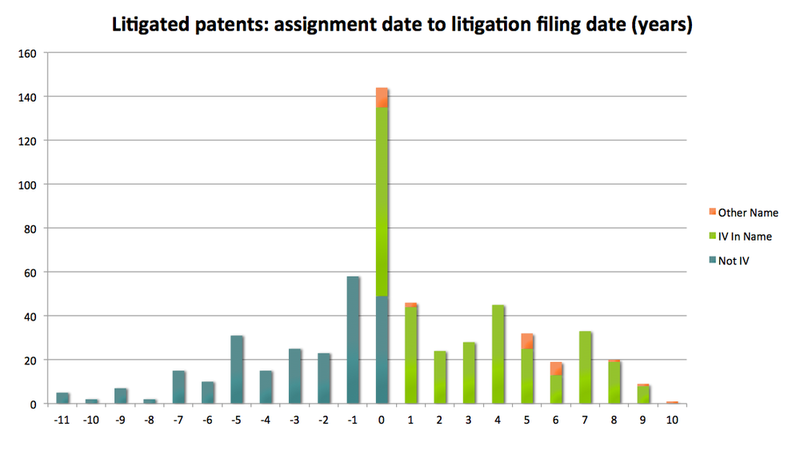 What’s Inside IV’s Patent Portfolio? In December 2013 Intellectual Ventures (IV) took a step towards transparency by publicly listing about 33,000 of its patent assets, representing 82% of its patent monetization portfolio (http://patents.intven.com/finder). Analyzing IV’s portfolio has now become a tractable problem. Kent Richardson and Erik Oliver penned an article for IAM Magazine that examines what is in the portfolio, what IV buys and what IV did after the purchases. This article is published in IAM Magazine, Issue 66 July/August 2014. We thought you would like to see some of the analysis. The above graph illustrates when assets in IV’s portfolio were litigated relative to their assignment to IV. IV purchases many assets that have already been litigated, but also litigates a similar amount after purchase. It is also clear that most of IV’s litigation is in it’s name, with only a fraction being asserted in the name of a holding company. This graph shows the concentration of sources for IV’s purchases. Though the majority of deals are with small or individual entities; this misses an important insight. Due to the size of a few large deals, most of IV’s assets are from very few companies. 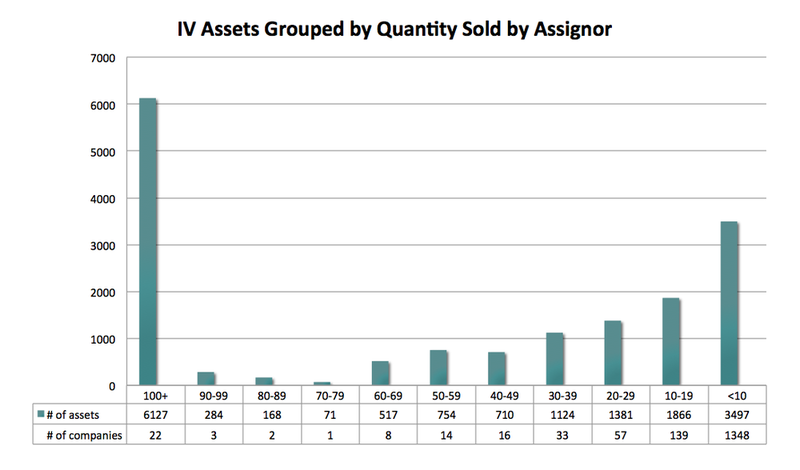 22 companies sold IV more than 100 assets and the assets from these companies’ accounts for 37% of IV’s portfolio. Approximately 60% of IV’s assets come from only 100 companies. The conclusion? An active cross licensing, or licenses that spring when a transfer to an NPE occurs, could have greatly reduced NPE risk. Here is the list of those top 100 sellers of patent assets to IV. Additionally, Richardson Oliver Law Group is offering the data set supplemented with our proprietary data. Clients of Richardson Oliver Law Group can obtain this data at no charge by contacting ROL Group. An example of the data available in ROL Group’s analysis, available for purchase. IV published their portfolio of approximately 33,000 assets at the end of 2013. We then compiled and analyzed further information on the US assets in their portfolio in order to get a better picture of the portfolio as a whole. This data includes assignment records for the transfer to IV ownership, from whom the asset was assigned, the age of assets in their portfolio at the time of transfer, priority dates of assets, if an asset has been litigated, and the technical areas most of each asset. This data can be used to evaluate the risk IV poses to a particular field or company based on the percentage of their portfolio in that field, the litigation history, and the expected expiration of assets in that field. This information will guide business decisions on building a defensive portfolio, making cross-licensing agreements, and inform negotiations of licenses with IV.